Joining me at the signing event is acclaimed Scottish comics artist Colin MacNeil, who will sketching and talking about his work. Celebrated for drawing beloved 2000AD characters like Judge Dredd and Chopper, Colin has also illustrated Captain America, Batman and Conan the Barbarian in an amazing career spanning thirty years. This special event is being organised by Biggar Library and Biggar's own Atkinson-Pryce Books, the Scottish Independent Bookshop of the Year for 2016. The event is free, but please let the library know you are coming by calling 01899 222 060 before Saturday. Copies of THRILL-POWER OVERLOAD will be available to buy on the day. 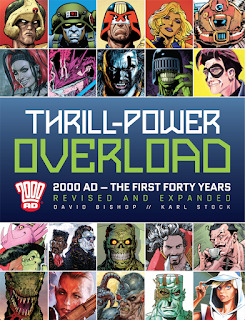 This heavily illustrated, glossy colour hardback costs £35, but everyone who buys a copy on the day also gets a bundle of 2000AD or Dredd comics from my private collection as a bonus.